Every child is born with an innate love of nature. With awe and wonder, they will dance with butterflies, marvel at the buzzing of bees, and giggle at the antics of a squirrel. Mother Nature offers an irresistible array to the senses. What child can resist picking up souvenirs as they walk along? Rocks, bird’s nests, seed pods, leaves, shells, feathers, bones, flowers… Each treasure is precious and soon your child’s odds and ends become a full-fledged nature collection. Resist the urge to secretly release these items “back into the wild”. By creating a special place where your child can display their collected treasures, you are telling them “I respect you and value what you value”. By valuing Mother Nature, children will develop a deep love for all living things. What we love, we protect. Parents have a unique role in creating future stewards of our planet. Understanding and stewardship of Mother Earth begin when children gain an awareness of the natural world in which they live through hands-on experience. That awareness hopefully will then pique their curiosity and inspire them to gain knowledge about how nature works. This knowledge then bestows on children the desire and capacity to act to protect Earth. Now that we know how important maintaining this collection can be, let’s talk about designing a space that will promote learning and creativity in your child. You’ve gathered all of the natural items together, but where in the house should they go? How do you display such an eclectic collection? People sometimes display these items in glass jars or frames. This may be beautiful to look at but often keeps the objects inaccessible to the child, which defeats the purpose. 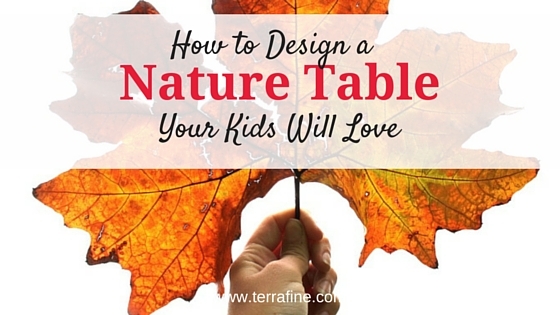 What you need is a nature table, a space dedicated to the changing array of beautiful natural objects your child will find. Not enough space for a full table? A tray or shelf works also. The keys are making it accessible and inviting to your child. Nature tables are common in Montessori (Michael Olaf is a fabulous resource), Waldorf (inspiration here at Bella Luna Toys), and Reggio Emilia-inspired learning environments(An Everyday Story has a great example), and is a magical place for scientific discovery and wonder. 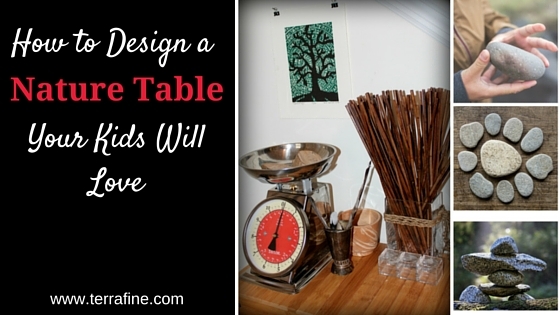 Whether you follow one of these philosophies in your home or simply want to encourage your child to connect with Mother Nature, here are some ideas to help you design a nature table your child will love. Simple and clean designs work best. Collections can easily look cluttered. Don’t feel you have to cram every object you have into the space. By having some objects in storage, you can keep things fresh and interesting by rotating them out periodically. If possible, place your collection near a sunny window. Natural light is not only inviting, it can be stunning if you incorporate fun elements like prisms. Locate it in a living space, not the bedroom. Kids want to be where the action and adults are. If the nature table is near where you spend most of your time, children are more likely to use it and be respectful of the materials. Use glass jars, baskets, tie drawers, segmented serving platters, vases, utensil drawer organizers etc. For a clean, sleek look, put everything in glass containers. For a more eclectic feel, don’t be afraid to mix and match textures. Natural materials are more enjoyable to touch, so try to stay away from plastic. If your child isn’t immediately drawn to it, it needs work. Let them be your guide. Consider wall art and mirrors. Mirrors are great at adding depth and perspective. Know your child and make it age-appropriate. If your child tends to put small objects in their mouth or is likely to throw rocks, reconsider placing such items on the table. Teach respect for the materials. Show them how to be gentle with delicate objects and how to appropriately use materials and tools. A great way to welcome and celebrate the natural cycles of the earth. Add depth to their learning by also reading books about the seasons and let your child help redecorate. The ephemeral art of Andy Goldsworthy is a good start. Show images or have a book near the nature table as a creative springboard for making art with natural objects. Allow your child to curate. By giving them the power to change their environment, children are more likely to care for the space and treat it respectfully. Provide tools for inquiry and exploration. At the very least have a magnifying glass available. Additional tools can be a scale, balance, measuring tapes, bug loupe, flower press, notebook, and pencils. Subjects can include rocks and minerals, animal track identification, natural sciences, field guides, etc. These can be used to help identify objects, plants and animals observed on their walk. Nothing beats experimentation when it comes to design. Don’t wait until you have everything perfectly planned out. You’re sure to make adjustments along the way, especially as your child grows and interests change. This nature space should be beautiful and inviting but don’t worry if it’s not Pinterest-worthy! It’s less important how it looks than how user-friendly it is. In other words, it can look stunning and still be useless if your child doesn’t find it engaging. Follow their lead. 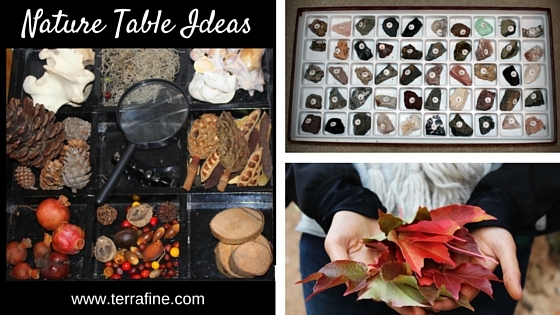 Are you inspired to create a nature table for your home or learning environment? Do you already have one? 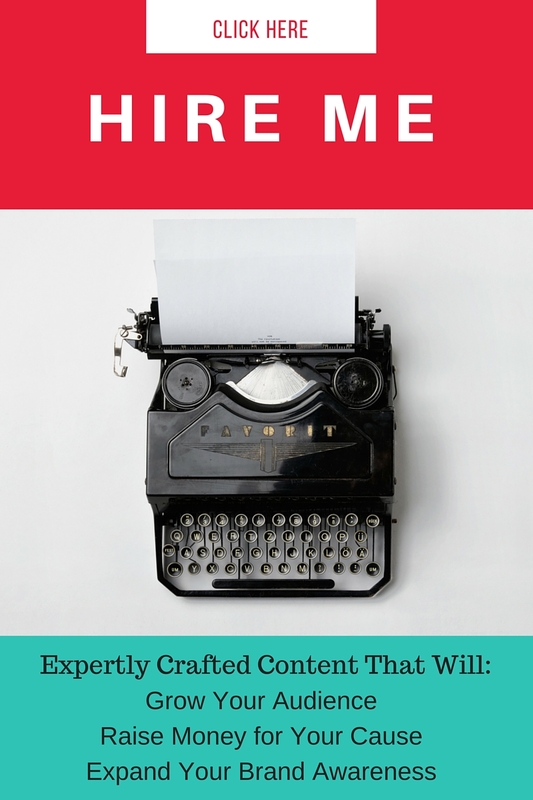 If so, I’d love for you to share! Post photos here on Facebook. This entry was posted in Creativity, Education, Evolving Spaces, Nature, Parenting and tagged child, inquiry-based learning, Montessori, nature table, Reggio Emilia, Waldorf. Bookmark the permalink. ← Can this Unique Swing Increase Bonding and Love?